I have this diagram on my white board that I need to erase. It’s taking up a lot of space. It looks like a chemical reaction. It was drawn in a fit of inspiration after I watched a science show about the expanding universe. Entropy is a word that was coined to describe the second law of thermodynamics, which basically says that energy in a closed system, will dissipate toward some state of equilibrium. It is why the universe is expanding but it’s also why ice melts and bodies decompose. 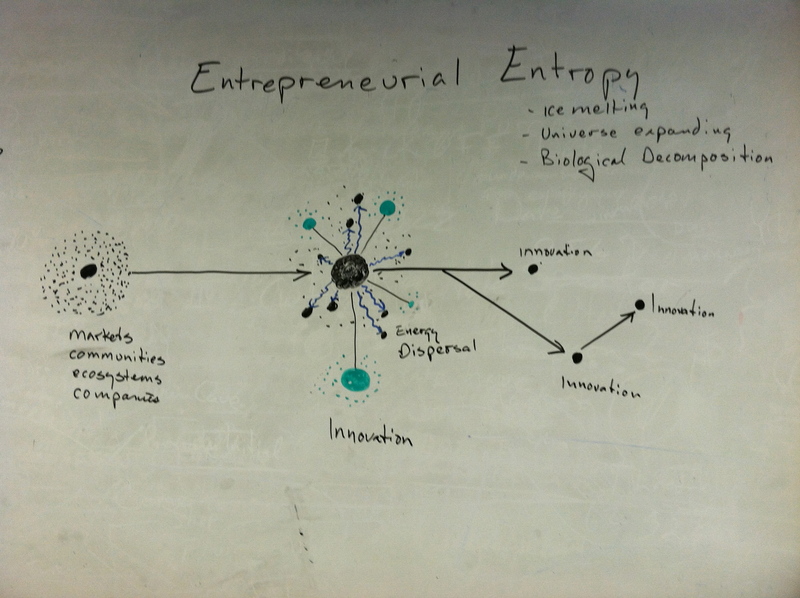 The timing of the this epiphany came during a “period of transition” in our community as there are now several organizations that support entrepreneurs; all striving for recognition, relevance… and funding. So many people competing with each other to do good. So much energy consumed maintaining the status quo. It’s like our collective energy is dissipating toward some state of equilibrium… ENTROPY! It’s a cloud that represents the community with everything in its place, working efficiently, and well measured. Then something happens to change things and all of the sudden a lot of energy gets spent to achieve the next state of equilibrium. Equilibrium consumes energy. Or rather, it dissipates it. This process is painful. Innovation is sacrificed for efficiency and a well ordered system. A lot of money is spent on resources to manage the system. And perhaps most frustrating, attention is poured into efforts not focused on why you’re in business in the first place. If this is truly an example of Entropy, then, at least philosophically, you can’t do anything about it. It’s a law of the universe. It is the way of things. If this is true, then this reaction is predictable and therefore can be “managed”. Status quo can be the impetus for change. Change can be embraced as opportunity. It can be a time for the innovators to get out and make the way for change. The key then is to learn to recognize the equilibrium in the system and look for way to focus energy on a new and better solution. This is the role of the innovator. He or she is the one that gets out. Ahead of the status quo. Seeing what’s next and going to find it. To be the catalyst for the next upheaval. To sense a state of equilibrium and realize a lot of energy could be pointed in a different direction to solve a real problem. But unlike the prophet who merely points the way, the innovator hoists the pack, grabs the walking stick and finds the way. While the entropic crowd worries about maintaining itself, the innovator discovers a way to provide value to a willing customer. 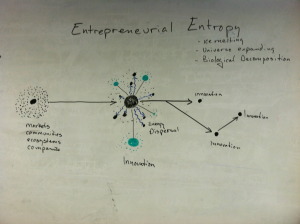 And when this happens, the innovator has become an entrepreneur.